We know that your brand is your identity. We take your brand guidelines very seriously in everything that we do and truly become your brand expert. When we provide any of the services below you can be sure that you have an extension of your marketing department, with full guidelines in hand, to present your identity correctly, uniquely, and perfectly on point. Promotional Products are an extension of your brand. They define to the customer and potential customers who you are, what you stand for, and increase loyalty – constantly working to improve your overall brand awareness. We work to find unique branding solutions that will increase your ROI, while impressing your customers and providing unique and memorable experiences. Ever wanted to have a gumball machine with your name on every gumball? We can do that, and so much more. Our unique facility allows us to help you complete your fulfillment projects from the very simple packaging assembly to the extremely complex. We have warehouse space that allows us to take in your items, assemble them on site, and then ship them directly to your customers. We make your life easier by taking care of the delivery and distribution of items to your customers, on time and within your budget. Are you seeking a specific product yet can’t seem to find it? We can help! We will gladly assist you and your team to identify the perfect items to promote your brand and increase your customer reach. Our database has thousands of items at every price point, from pens to mugs, to shirts, bags, and more – we can help you identify and brand it. Are you looking to have your own online company store? We can create a one-of-a-kind website specifically designed for your internal employees or external customers to order branded merchandise that can be stored in our warehouse or yours. For the ultimate solution in online company stores – contact us today. Over the years we have hosted and sponsored numerous events and have always relied on Positive Impact for promo ideas and fulfillment. We often have short deadlines and their turnaround time always meets our timeframes. Working with Jody O’Rourke and her team is always a pleasure! 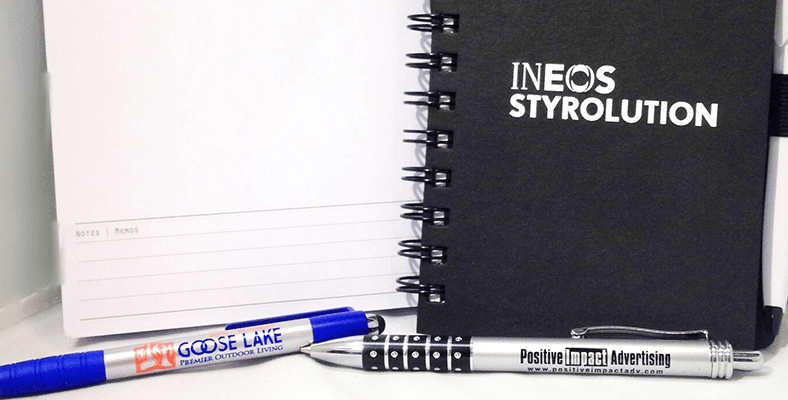 We high recommend Positive Impact for all promo item needs! Laure Poquette Itelligence, Inc.